When New Horizons zipped past Pluto on July 14th, 2015, it collected a lot of data. Couple that with the spacecraft’s agonizing, 1-2 Kbps transfer speed, and you arrive at a rather amazing fact: More than half of the data from the historic Pluto flyby is still on the spacecraft. Sailing a probe into the cosmic void is risky business—New Horizons is currently 3.3 billion miles from Earth and still trucking— and NASA wants to ensure it gets all of its datasets back before something goes wrong. Over on the New Horizons blog, Emma Birath of the Southwest Research Institute in Boulder writes about her effort to build software that ensures the data comes down to us as efficiently as possible. It’s a short read, and well worth it if you’d like a bit more insight into the challenges behind acquiring groundbreaking scientific information over the Solar System’s worst dial-up connection. We knew last summer that it would take New Horizons 16 months to send us all of the data it collected during its glorious flyby. 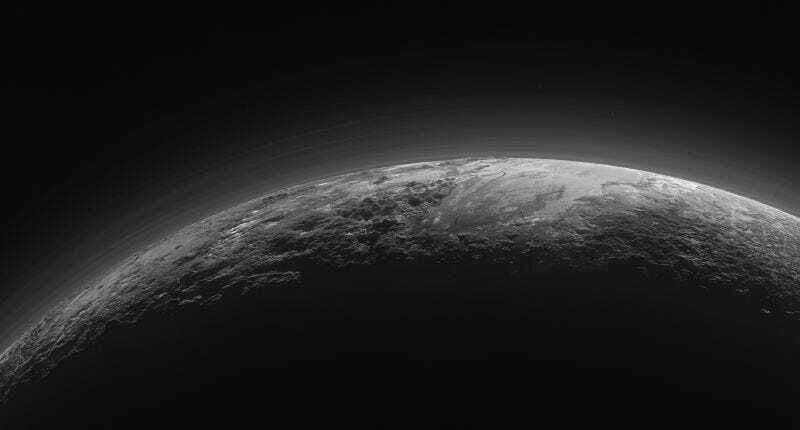 But it’s still incredible to consider that despite all the hi-res images, geologic maps, atmospheric models, and generally amazing things we’ve learned about Pluto these past seven months, we still haven’t seen the bulk of what’s in that piano-sized probe’s memory banks.